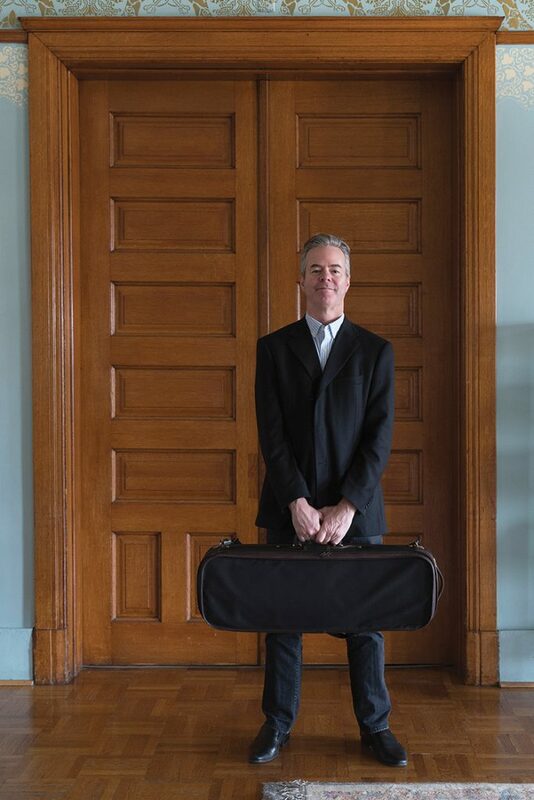 Leaving a rehearsal recently at Roosevelt University’s Ganz Hall, student cellist Miles Link couldn’t help but wonder about the instrument inside the violin case slung over artist faculty member Frank Almond’s shoulder. A member of Roosevelt’s Chicago College of Performing Arts (CCPA) Chamber Orchestra, Link knew the case held a violin: Almond had been playing one at a rehearsal. Was it the rare and celebrated 300-year-old Lipiński Stradivarius worth millions of dollars? Or did the case with the police memento contain one of Almond’s more modern, yet less notorious violins? Link thought he knew the answer, but didn’t immediately ask. He had heard about the Jan. 27, 2014 theft of the Lipiński Stradivarius, taken from Almond as he walked to his car after a Milwaukee performance, and he also knew of the violin’s recovery by police from a frigid Milwaukee attic nine days later. “He (Almond) is a great violinist and someone who I knew I should be making conversation with if given the chance,” recalled the aspiring sophomore cello performance major and second chair with Roosevelt’s Chamber Orchestra. Like many in the tight-knit classical music community, however, Link was reluctant. It was a delicate matter, Link knew, and not something to be bandied about or taken lightly, as Almond is the only musician on record as the victim of an armed robbery targeting a specific musical instrument. “Frank (Almond) is a terrific violinist with a beautiful sounding instrument and a very dramatic story,” said CCPA Dean Henry Fogel, who welcomed the internationally acclaimed soloist to CCPA’s string faculty in the fall of 2014. The decision to invite Almond to join CCPA’s music faculty, which is composed largely of orchestra professionals, including nearly 30 musicians alone from the Chicago Symphony and Lyric Opera orchestras, wasn’t difficult. A concertmaster and 20-year veteran of the Milwaukee Symphony Orchestra, Almond has two degrees from the Juilliard School in New York City. At 17 years of age, he was one of the youngest prizewinners ever in Italy’s internationally watched Nicolo Paganini competition. At 22, he was a laureate in Moscow’s International Tchaikovsky Competition, the so-called “Olympics of music,” where he gave a prize-winning performance that is part of a celebrated PBS documentary about the contest’s East vs. West rivalry. Since then, he has regularly toured as a guest concertmaster, soloist and chamber musician at venues around the globe –sometimes, but not always, performing on the Lipiński Stradivarius. Last fall at Roosevelt’s Ganz Hall, for instance, Almond was a soloist with the CCPA Chamber Orchestra performing Soul of a Nation, a concerto for violin and string orchestra about Thomas Jefferson that was written for Almond by American composer Victoria Bond. Also in the fall, he and Roosevelt’s student musicians recorded the piece for a commercial CD of Bond’s music about U.S. presidents that will showcase CCPA student musicianship and will be released in 2017. The violinist was encouraged to join Roosevelt’s faculty by CCPA artist faculty member and fellow violinist Stefan Hersh, who leads CCPA’s Chamber Music Program. “Frank (Almond) is among a rare breed of musicians who can cross boundaries,” Hersh said. “He can do a lot of things very well, including teaching.” Colleagues and friends for 20 years, both Roosevelt violin instructors have been inextricably involved with the Lipiński Stradivarius – Almond as its keeper and Hersh as its chief expert. “It’s a high-end tool that allows you to maximize your capabilities once you know how to play it,” said Almond, who has learned much about the instrument’s temperamental nature and how to best adapt in the eight years he’s had it. 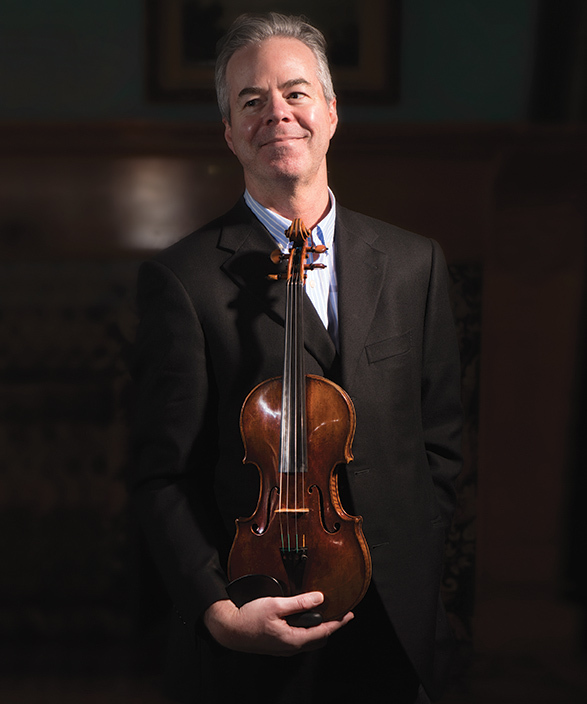 Frank Almond and the 300-year-old Lipiński Stradivarius. 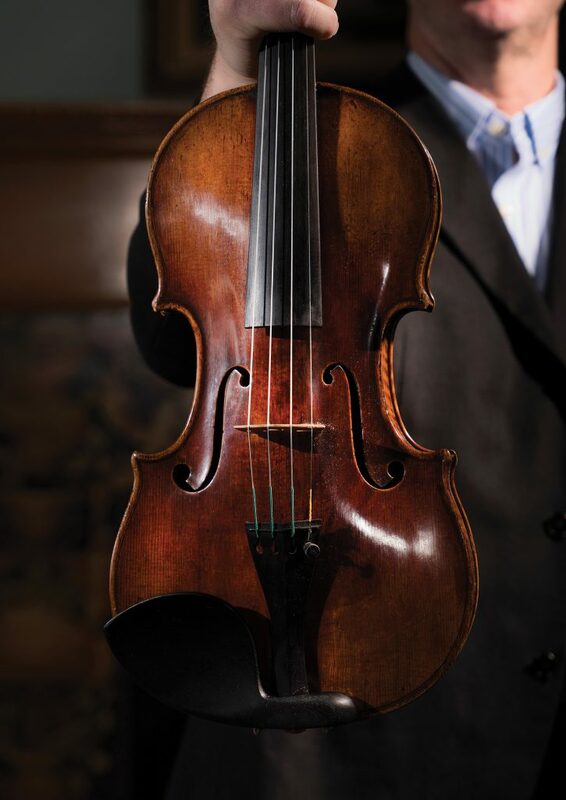 “It is one of the finest of violins that Antonio Stradivari ever produced,” added Hersh, who has examined about 200 of an estimated 500 still-existing so-called Strads, selling approximately 20 of the rare instruments during his lifetime. Almond took Hersh with him to a Milwaukee bank vault in 2008 to authenticate that the Lipiński was actually the real thing before eventually being offered the instrument on loan from an anonymous owner. It has a comprehensive lineage, including previous ownership by Italian “Devil’s Trill” composer Giuseppe Tartini and Polish soloist Karol Lipiński, as well as a 12-year gap from 1996 to 2008 when the instrument was not seen publicly. Hersh was the first one Almond phoned from the police squad car following the theft. Hersh also was called to assess the violin’s condition, taking it to his Chicago shop for adjustments, after the Stradivarius was found safe, wrapped in a baby blanket in a suitcase in an unheated Milwaukee attic. Now, the two Roosevelt professors are to be part of a new documentary movie, whose working title is “The King of Strings,” which is currently being filmed about the infamous heist. Special Agent David Bass, a member of the FBI’s art-theft team who was interviewed for the film, stresses that the crime that made worldwide headlines was irrational, an anomaly and the work of someone who didn’t understand the slightest about the rare instrument field. While he has instructed Almond to keep the violin’s whereabouts secret, Bass doesn’t believe the violinist should be blamed for not doing so previously. “It’s what musicians do. They carry instruments around, and there are a lot of them out there who have rare ones,” said Bass, who believes the real impetus for the armed robbery may have been an ill-thought-out plan to collect a reward at some point after attention to the case died down. Because of non-stop media interest, the case didn’t go away quickly. In fact, Almond was entangled for months in criminal proceedings, which finally ended with sentencing of Universal Knowledge Allah to three-and-a-half years in prison and Salah Salahadyn to seven years behind bars in late 2014. “Many of my days, even after I started at Roosevelt, were spent talking to cops, insurance people, FBI agents, taking lie detector tests and giving witness statements,” said Almond. “It’s quite a bit different than giving a concert, and as a musician it’s not something I expected to be involved in.” he said. Through it all, Almond has learned to be vigilant, attaching to his violin case a memento that was given to him by police, and which serves as a constant reminder. “Seeing him with that case was a bit uncomfortable at first,” said Link. The Roosevelt student decided he had to say something as the two entered a University elevator. “Is that the Stradivarius?” the student cellist asked after the doors shut. Cautiously, Almond looked at Link. “Maybe,” he said. Then, Almond broke the ice by pointing out the police memento he had attached to the violin case. Link listened with interest as Almond shared his story about the heist and all that the violin had been through. “I really think Professor Almond had the Stradivarius with him,” Link said. Maybe, but only Almond knows for sure.